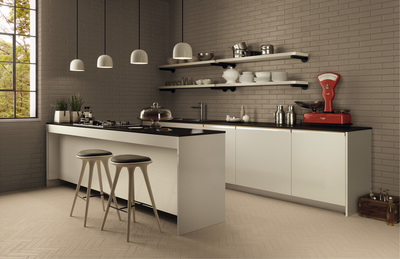 The Kotto collection creates extremely attractive contemporary interiors thanks to the timeless beauty of clay. 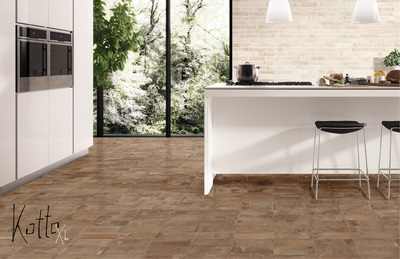 The marks left by time and hand-processing which feature on the XS tiles in the series are the basis for urban interiors with personality, style and warmth. 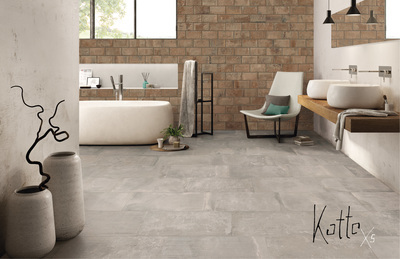 Kotto is also a highly versatile collection thanks to the many exquisite decors and the Brick bare brick wall covering, also splendid on floors, giving the potential for a very wide variety of home design combinations. The long side of each brick retains the distinctive signs of hand-moulding and the residues of sand from the mould. On the short side it conserves the marks left by extraction from the mould. This allows bare brick walls to be constructed with the bricks end-on or side-on, conserving the intrinsic nature of the material. The brick series also includes the “whitewashed brick” shade for building the type of whitened wall typical of urban architecture. ...and that of brick design! A series of bricks in six colour shades, three warm and three cold, which can be mixed and matched; suitable as both wall covering and flooring. The tactile structure and the flaws left by the forging of the piece, still visible through the full, strong, matt colours, generate light and shade effects which give finished surfaces an extraordinary movement and variety. ​Brick Design is a versatile series, ideal for every lifestyle, from the metropolitan designer loft to interiors in more traditional taste. The “Paint” decoration system has been created to meet the demand for personalisation from architects and interior designers. Bricks which can be completely customised in colour and quantity, enabling a whole surface to be set alight, even with a single brick. Brick Design Paint brings vibrant colour to any interior and truly sets the imagination free.